Firstly, I've never even tried Simnel cake but, since writing a piece on the history of it for my food writing class, I now know a fair bit about it. 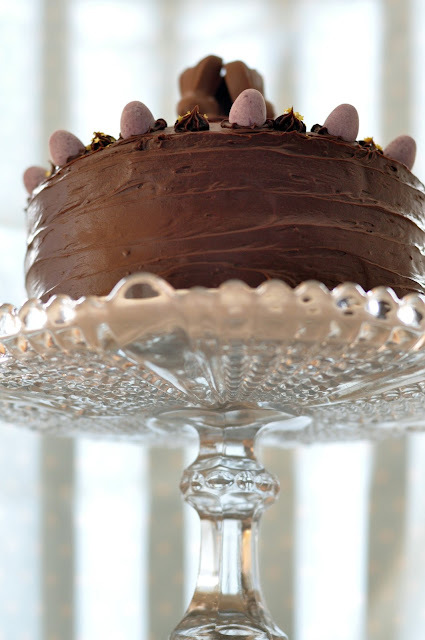 Enough to know that the chocolate Simnel cake I made breaks all the rules...sorry Simnel cake purists! There's no fruit and there aren't 11 balls of toasted marzipan representing the 11 apostles (minus Judas). 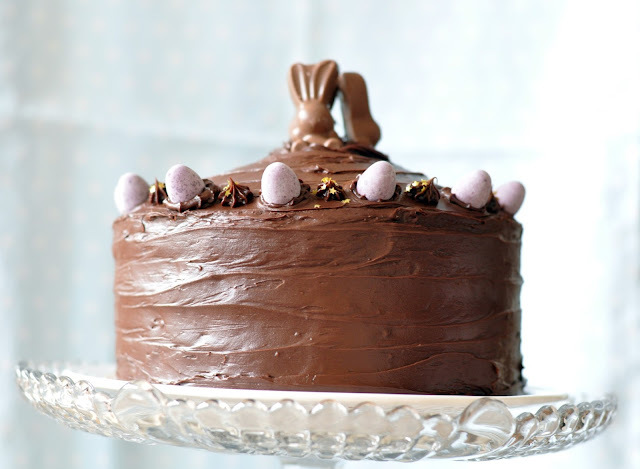 Instead, I went for a 4 layered chocolate malt sponge, sandwiched between layers of chocolate fudge buttercream, covered in more chocolate fudge buttercream, topped with mini eggs, malteser bunnies and a little dusting of gold stars. This is the same recipe I used for my malteser bunny cupcakes, just doubled up to make the 4 layers. Mini eggs and malteser bunnies for decoration. Preheat the oven to 180 degrees and grease 2 8 inch round sandwich tins (I used Dr. Oetker's cake release spray). Slowly add the egg, a spoon at a time, lightly beating after each addition. Add the vanilla extract. Divide between the two sandwich tins and bake for 15 minutes. Repeat these steps again so that you have the four layers. For the buttercream, melt the chocolate in the microwave or over a bain marie. They're non toxic, so you can eat them but technically not edible! I seem to put them on a lot of my bakes now! Thank you :)! Love those little guys! It's like you just read my mind, I've been thinking about making a very similar cake this week. This looks sooooo good. Oh, Jo! It really is so fun to make, hope you do! I've just found your blog and I adore it! Great name and exactly the same interests as me! Great names, great minds. This is a really cute take on the traditional. I looove those Malteaser bunnies! Thanks Sophie, love your blog too. Your pizza pops are so cute!